To a writer, there is nothing more terrifying than that blank page waiting to be filled with words. I suspect the same may be true for many artists as they face a blank canvas. 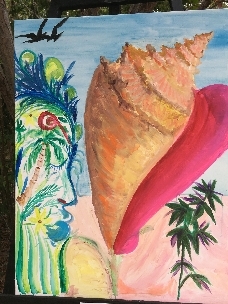 I was at an art festival in the Bahamas recently. One of the activities was Participaintion. 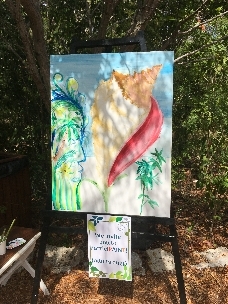 A blank canvas was set up and acrylic paints were provided. 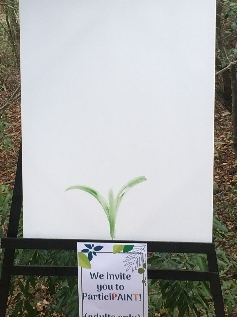 Adults were welcomed to help create a painting. There I was, surrounded by a couple dozen artists, but no one would start the painting. 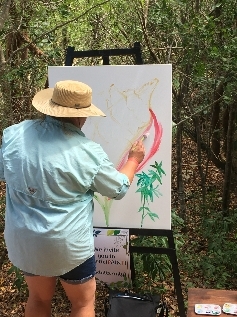 The event was at the Leon Levy Plant Preserve. I put green paint on a brush and created a sprout, three green leaves at the base of the painting. I hoped the painting would grow from there. By the way, I was at the event to help launch my seed adventure, Grow Home, Little Seeds. I thought a sprout was appropriate. Growth came slowly to the painting. Someone added a swoosh of pinkish-red. Then someone added a plant (much better than mine). A visitor added what was supposed to be a hibiscus bud, but it evolved into a conch shell. The bud morphs into a conch shell. Then the painting burst forth. A face was added and embellished. Bees became birds. The colors were enhanced into an incredible creation. More people have stopped and added to the painting. A face takes form on the left. 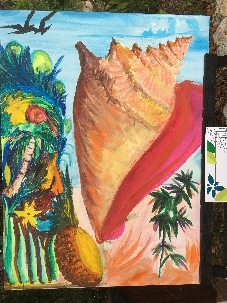 The conch shell is looking good. The group painting is spectacular! But if you look closely, you can still see my sprout. Elaine A. Powers writes science-based children’s adventure stories. One of them is Grow Home, Little Seeds, about a graduating bundle of mixed seeds from the Leon Levy Preserve. They vow to stay together and form their own forest, but their natures lead them in different directions. Will they find what they need to germinate, to put down roots? 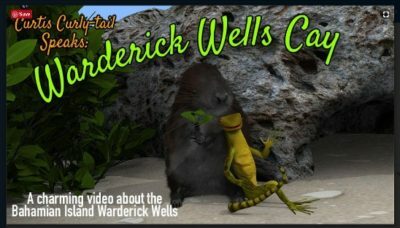 Join these Bahamian natives on their exploits as these friends each find a place to call home.